Sweat can be a serious issue, whereas it may be embarrassing in small to large amounts. Although sweating is natural, it’s also mostly frowned upon. Sweat can actually be linked to a medical or psychological issue, as opposed to simply standing or sitting underneath the sun. A person’s capable of sweating anywhere: armpits, head, hands, and even feet. While sweaty feet may not be as noticeable as sweaty armpits, head, and hands, it can be an extreme personal matter. There are ways of getting rid of sweaty feet. Like your armpits, feet need to breathe as well. Avoid wearing socks that contain polyester or nylon. Polyester constricts more to skin. Wear socks that are of cotton or wool material. Cotton and wool socks are much more comfortable and healthier for your skin. Bacteria is capable of getting anywhere on your body, including feet, and may be responsible for sweaty feet. Whether you wear socks or don’t, it’s important that you wash your feet daily. 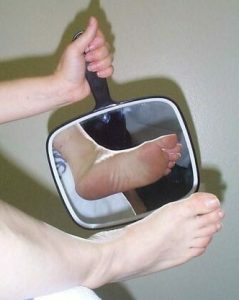 Scrub the top and bottom of each foot with soap and warm water. Make sure to wash in between the toes. Thoroughness is crucial here. Some people may not know that the body sweats while in sleep mode. This includes feet. Change into a new pair of socks the following day upon waking up and every day after that. If you plan on exercising that morning, then change into new socks after exercising and showering. Besides baby powder being commonly used on babies, it can also serve as a sweat absorbant. Put some baby powder on your hands and rub down both feet with the powder. This should be done after showering. Your feet must be completely dry for the baby powder method to be effective. Put on socks immediately after you rub down both feet with baby powder. If none of the tips mentioned above work, then consider botox. Botox is confirmed to be effective for treating armpit sweat. What it does is the ingredients contained wihin botox interfere with signals that the nervous system is emitting to the sweat glands. Consult with a doctor for more information.